Setting up the degree show was stressful, fun and satisfying. It was brilliant to see my pieces displayed on the wall, the inspiration photo’s matched the pieces well. Setting up was fun, it was good to have a ‘practice run’ for the new designers show. The graduating year this year is a really strong one, there are some fantastic designs on display that really show all the hard work that has been put in for the last three years. There is now less than a week until my final assessment of Uni and I am panicking. I have finished all the replacement roots and enamelled them. I didn’t think I would be setting anything in resin as some bright spark has added water to the catalyst which has basically ruined the whole bottle. If you add the catalyst to the resin gel, it bubbles and froths and goes the colour of muddy puddles! Luckily the technician had some more in stock, so disaster averted I carried on setting them. The root pieces that I skimmed yesterday really didn’t turn out as I had hoped so I’m glad that I had the extra roots to reset. There wasn’t really much more I could do in the afternoon so I concentrated on some of the pop up shop things. It was really nice to do something that wasn’t root related. Another bad day …. I got into the workshops this morning, made my way to the resin room to pull out my pieces and … the silver has set too close to the surface of the resin. I’m going to see if I can save them by sanding back as much as I can and then re skimming the surface but I’m not holding out much hope …. I’ve started to make some more roots just in case, at this stage I would rather be prepared than leave things to chance. I’m really beginning to despair with this project, it just seems to be never ending. Everything is finally beginning to come together. The caps are finished and have now been set to the pieces using resin, as have the brooch pieces. I’ve placed an order for some clasps for the necklaces so as soon as they arrive I will be attaching them to the chain. Until then I’m going to keep the chain in one piece to help prevent it from knotting. I’m a little bit disappointed with myself as I have left fingerprints on some of the pieces when I added the resin to set the silver … I’m hoping that they will come out with just a light sanding! 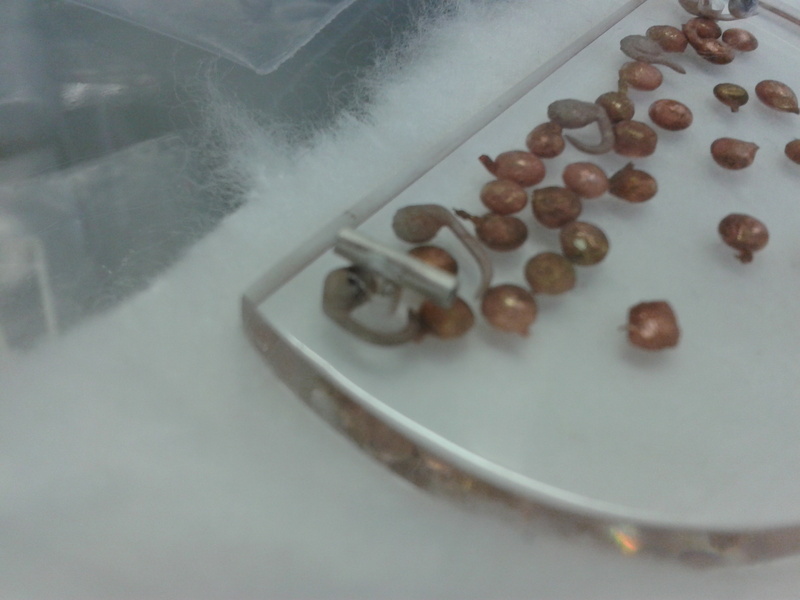 Tomorrow is going to be the final soldering and enamelling of the last root parts! I’m doing a couple of days in one post again… I’m really busy so forgetting to post regularly! Thursday: I finished forging all the remaining root pieces. The next stage with these is to begin soldering on all the offshoot pieces. I met with the tutor today and she suggested finishing one piece to completion. I’m unsure yet what I want them made into so will work on final designs at the weekend. I know one piece is going to be a brooch and another a necklace but I’m not sure about the others. I know I don’t want to make all brooches. Friday: I worked all the final scratches out of stages 1 & 2. I’ve drilled the holes for the fixings and began to make the fittings. I think I will have to start again on some pieces though as they aren’t up to scratch. Today I have sanded back 3 pieces to completion – it’s such a relief to get something finished to this extent. They still need the silver ‘hardware’ on them but still the hard part is definitely done! I was a little concerned that I was unable to get all the scratches out. 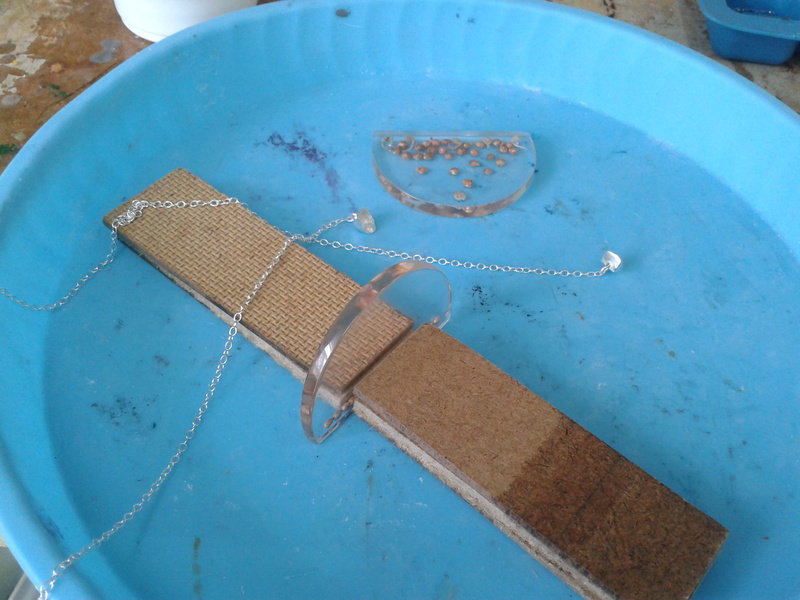 I tried the polishing wheel and I also tried Brasso but there were still quite a lot of scratches in the piece. In the end I tried some Zinc Oxide that I had. It is normally used for the final polish of stones in lapidary. I added some water to a small amount of powder to make a paste then rubbed the paste into the piece. The paste did a fantastic job of getting rid of all the small scratches. I’m going to keep hoarding this powder because it is brilliant. But then disaster struck, I dropped one of the pieces and cracked the corner …. I think it may be salvageable but still I wanted to cry … I’m just going to put everything away and work on some designs for the rest of the day!